A smile can change your life. From the way you feel about yourself and how others see you and interact with you, your smile is not only a key factor of your overall health, it is your invitation to others and the first thing people see. Greenwich Dentist Gerald Cohen and Greenwich Cosmetic Dentistry are smile experts. They offer many Cosmetic Dental Services to meet your needs and budget. From dental whitening and the straightening of teeth to the restoration of missing teeth and full mouth reconstruction, Greenwich Cosmetic Dentistry can restore form, function, and the esthetics of smiles for most people. 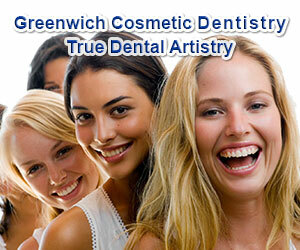 Greenwich Cosmetic Dentistry uses the best technology for the best dental care and results. A 3D Cone Beam Scanner allows for a more precise placement of dental implants and provides superior diagnosis of unseen dental problems. Their onsite dental lab allows for The Perfect Match™ in dental restoration, because shape, color, and alignment all matter when matching dental restoration to your natural teeth. Greenwich Cosmetic Dentistry also provides general family dentistry, dental implantology, periodontal treatment, as well as sedation dentistry and many other dental services. Visit their website to see amazing Smile Makeover Cases – the before and after dental work gallery, watch video testimonials of patients and learn about the many dental services provided.